Although the Maoris arrived from Polynesia around AD900, the first Europeans did not find New Zealand until 1642, when the Dutchman Abel Tasman sighted the new land on his voyage in the Pacific. He travelled up the west coast for over a month, attempting unsucessfully, in the face of hostility from the native inhabitants, to land to obtain fresh water. The first significant voyage of discovery to Aotearoa New Zealand (Aotearoa is Maori for "Land of the Long White Cloud", an earlier name for New Zealand given by the Polynesian explorer Kupe, upon discovery of these lands about 1,000 years ago) and the botanical exploration was undertaken by Captain Cook between 1769 and 1770 in the Endeavour reaching Dusky Sound (after sailing some 10,6000 miles through uncharted waters) on the South Island, where he traded with the Maoris, and spent the winter exploring the islands of the South Pacific. During a storm Cook became separted from the "Adventure" but, nevertheless,sailed south once again on November 27. He once again reached the ice pack, in mid December, and continued his search for a way through to the south. Cook's skill as a seaman and navigator cannot be challenged.. through heavy storms and dangerous seas filled with huge icebergs the Resolution survived without the loss of a single man. On January 30 he reached his furthest south but could go no further. The ice "extended east and west far beyond the reach of our sight, while the southern half of the horizon was illuminated by rays of light which were reflected from the ice to a considerable height... It was indeed my opinion that this ice extends quite to the Pole, or perhaps joins to some land to which it has been fixed since creation". Cook once again wintered in New Zealand, leaving in November 1774 on his third voyage. "vegetable sheep", later named raoulia. Joseph Banks, explorer and botanist. Cook writes in his log: "The face of the country bears a very rugged aspect, being full of craggy hills, on the summits of which are several patches of snow"
After this he sailed to the island of Tahiti. The two ships returned to England on 29th July 1775 via the south Pacific and after five weeks arrived at the island of Tierra del Fuego and Cape Horn. Cape Horn from the west. The island of Tierra del Fuego (Land of Fire) is situated in the South Atlantic Ocean and is a territory shared between Chile and Argentina . 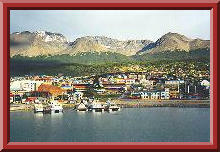 The southernmost point of South America, the city of Ushuaia situated on this island is the southermost city of the world. Captain Cook remained in the town of Bahia Buen Suceso for two weeks and then left in a north-easterly direction into the Atlantic. Unexpectedly, they sighted land and immediately thought they had finally found the southern continent but instead it was an island covered in ice, which they named South Georgia. 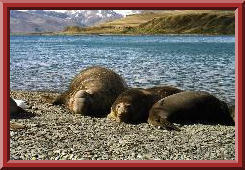 The seals pictures are Southern Elephant Seals, also known as Sea Elephants. These seals are circumpolar, found on most Subantarctic islands including South Georgia. In the pictures above is an adult male (left) and two females. Cook's intentions were to continue to England, his temptation to the south could not be resisted and at the end of January he sighted a group of islands even more desolate than South Georgia. These he named the South Sandwich Islands. After a week of exploration in them, he turned north for England, reaching England on July 30, 1775. The voyage lasted three years and eight days covering more than 60,000 miles. Cook had proved there was no southern continent unless it was at the pole itself. The experimental diets and close attention to cleanliness had a miraculous effect: out of a crew of 118, only one man was lost to disease! Two islanders from Tahiti came back with the expedition. James Cook was awarded the Copley Gold Medal and elected as a fellow of the Royal Society. Cook was promoted again after returning from his second voyage in 1775. He accepted his appointment as Fourth Captain at Greenwich Hospital but with condition: at 46 years of age he was not ready for this form of retirement so if his country were to call him for more active service or if he felt he could be of an essential service to the public, then he would quit the position. It didn't take long. The Resolution, now under command of Captain Clerke, was to sail to Tahiti to return a native who had been brought back to England by Tobias Furneaux on the Adventure when it loast contact with Cook's Resolution in the New Zealand storm of 1773. The Adventure was unseaworthy and Cook was asked in early 1776 to find a replacement to accompany the Resolution on the voyage. He recommended another Yorkshire collier, which the Admiralty accepted, renamed it the Discovery and promptly decided to take command of the expedition. On his third memorable voyage, especially significant to the history of the west coast of North America. Captain Cook and his men were primarily searching for the Northwest Passage from the Pacific Ocean to the Atlantic Ocean. They departed Plymouth on 12 July 1776 in the Resolution, and the Discovery followed a few weeks later. A leaking Resolution arrived in Capetown on October 18 with the Discovery arriving on the 10th of November. They left together on November 30th steering southeast in an attempt to locaste a group of island discovered some years earlier by Marion du Fresne. 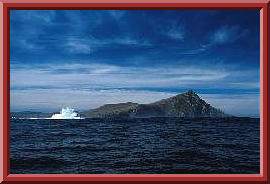 On December 12 they spotted the first of the island whereby Cook promptly named them the Prince Edward Islands. Continuing further south, on December 24 they say land exactly where they expected it to be. 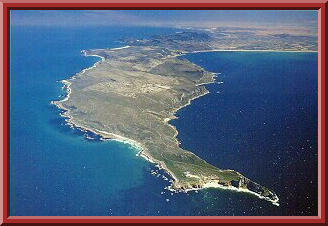 The land was an islet off the northwest point of Kerguelen's LA FRANCE AUSTRALE which they encountered later that day. The following day they entered a large bay and anchored near a sandy beach. Crew members went ashore and one of them found a bottle with a note in it containing an inscription in Latin recording the French visits in 1772 and 1773. Cook wrote of his own visit on the same parchment, placed it back in the bottle together with a silver coin and buried it again. Cook spent four days exploring the island and coastline. While unimpressed due to the lack of trees, shrubs and little grass, there nevertheless was a good supply of fresh water. 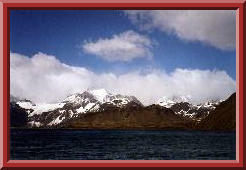 Cook called them the "Islands od Desolation" although they are known today as the Isles Kerguelen. Named 'Cabo da boa Esperavca' (Portuguese for Cape of Good Hope) by John II of Portugal because of it's importance of it being the new route to the east. On December 30, 1776, Cook and Clerke sailed away from the island for New Zealand. They continued north along the west coast of America in haste to the Bering Sea and Bering Strait in an attempt to pass through the Arctic Ocean during the summer season. Cook memorial, Resolution Park , Anchorage, Alaska. Several unsuccessful attempts to locate the passage were tried along the coasts of Canada and Alaska. Captain Cook also visited Russians at Unalaska and traded with natives, obtaining furs that spurred interest among British merchants.